You fund it, you contribute, you decide! 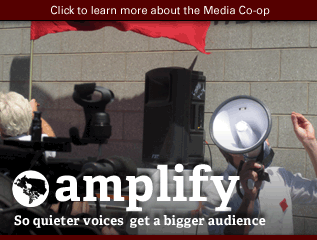 Welcome to the Media Co-op's second participatory budget process. 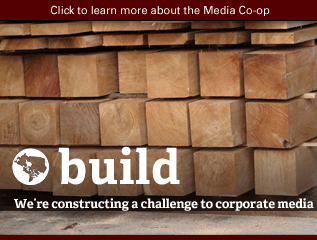 Our intention is to include Media Co-op members (the people who fund the Co-op and make the media) as much as is feasible in the decision-making processes that govern the Co-op, and define what the Co-op is. 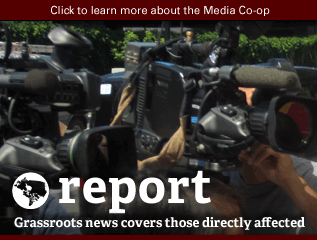 The Media Co-op had expenses totalling $118,192.58 for our 2012-13 fiscal year. After transfers to locals and specific project grants, $75,249.80 went to regular operations. We spent $46,004.22 (61%) on regular wages for our staff in Halifax, Montreal, Toronto and Vancouver. Our staff work part time and often volunteer hours over and above their paid work. 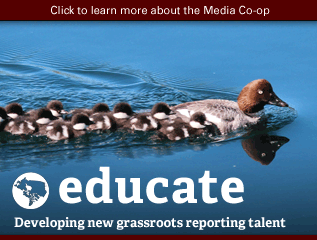 The tasks they do include member coordination, maintenance of the Media Co-op websites, editing, and content production for both The Dominion magazine and online for mediacoop.ca. 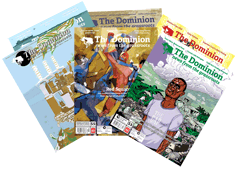 We spent $10,407.64 (14%) on printing six issues of The Dominion. We spent $5,085 (7%) paying freelance contributors who pitched stories to The Dominion, and the artists who illustrated them. We spent $2475.07 (3%) on advertising, promotions and fundraising materials for The Dominion and the Media Co-op. You can see a total breakdown of our 2012/13 financial year by downloading our our 2012/13 income statement [pdf]. NOTE: These financial statements have not yet been verified or accepted our general assembly. They are for consultation only and are subject to change. Have questions? Comments? Email info [at] mediacoop.ca. We invite you to go through the following priority areas, and rate them with a number of stars based on what you think their relative importance is. More stars for more important, fewer stars for less important. If you feel particularly passionate about a particular area, we strongly urge you to post a comment explaining why you think the area is more or less important. After a three-week voting and discussion period, a budget committee will be struck to fashion the results of the participatory budget process into an actual budget. This budget will then be sent to the membership. If there are strong objections, the committee will make amendments and submit a final budget. While all feedback will be taken into account, comments will carry more weight than votes (so comment!) and comments by members will carry more weight than comments by non-members (but no distinction will be made between members based on financial contributions or any other criteria). Note: you must be logged in to vote on priority areas, but anyone can post a comment. If you have issues or questions regarding the process, we're interested in your thoughts: email us at info [at] mediacoop.ca. To date, the Co-op has not devoted significant financial resources to video. 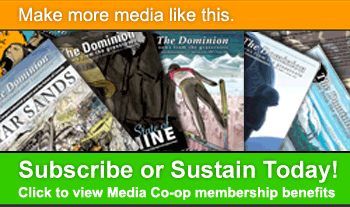 The Dominion is the Media Co-op's flagship publication. 1100 copies are printed six times per year. It brings in subscriber and advertising revenue, and the print publication is a key sustainer's benefit, one that is not available for free online. 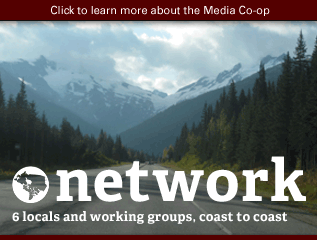 The Dominion features some of the strongest journalism being produced by the Media Co-op network. Publishing the paper requires substantial staff resources. The existing Locals (Halifax, Montreal, Toronto, Vancouver) need resources to hire journalists, fundraisers, editors, and otherwise maintain and improve their operations. 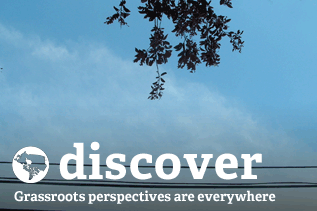 Locals currently receive 50% of all sustainer revenue coming from members in their area. Increasing communication and strengthening ties between Locals and the national network requires additional time on the part of paid staff. Special issues of The Dominion are ones where editors and writers put extra effort into covering a single issue in depth. They have a larger print run than regular Dominion issues. Recent special issues have had circulations of around 10,000 to 15,000, meaning that they expand the Co-op's coverage well beyond our regular readership. Special issues often attract new writers and new members. They generally bring in about as much money as they cost to produce, but also represent a significant amount of staff hours. 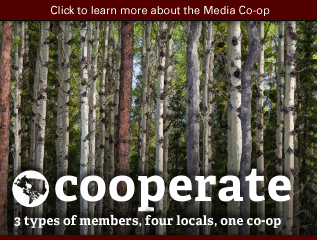 New Locals benefit their communities, and ultimately they benefit the Media Co-op. Starting new Locals stretches the resources of the Media Co-op in terms of staff time, technical support and the unique needs and challenges particular to each community. 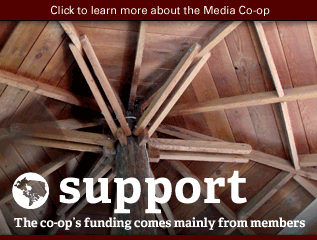 The Media Co-op depends on its membership for its funding, its overall direction and, ultimately, its existence. Membership outreach includes events (usually put on by Locals), sending e-newsletters twice a month, making phone calls to retain sustainers and subscribers, and coordinating the Annual General Meeting.